SUPER TIP: Insert "ez" before the word "VIMEO" in the URL address to download videos automatically from Vimeo.com as the fastest way! Now you can easily download your favorite HD and SD videos from Vimeo and can watch them without being connected to the Internet or on other devices! Just use one of the methods below and create your own video collection offline. Vimeo encourages users to download its videos with the permission of the original uploader, so many of the videos on Vimeo can be downloaded using the download button below the video (not all videos have this). If this button is available, click the button to view available formats that can be downloaded. 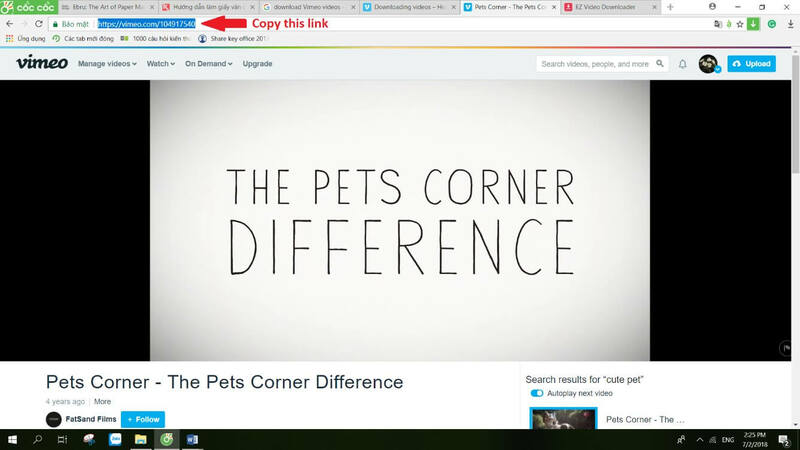 However, if you want to save some Vimeo videos that are not open to download, there are also a third-party website that allows you to enter the URL of the video you want to save to your computer. Below is some simple processes to download any Vimeo video on your PC for free. With https://ezdlvid.com/ you won't be asked to pay fee, sign up or install extra program. No popup, no virus, the site is absolutely clean. This site, a powerful video downloader which works smoothly in any browser is capable of downloading Vimeo videos more effectively. Step 1: First, go to Vimeo and navigate to the video you want to save. When you've found the page, press Ctrl+L on your keyboard to highlight the text in the address bar, and then Ctrl+C to copy the Internet address. Step 2: Once this address has been copied, open https://ezdlvid.com/ on your browsers and paste that URL into the text field by clicking inside the box and pressing Ctrl+V on your keyboard. Then, click the Download button. Step 3: If It’s done properly, a new window will appear displaying some available format videos for you to pick. Once you have selected your format, click the appropriate download icon. This plugin is a bookmarklet which is a tiny program stored inside a browser bookmark, and it's typically executed by clicking a button in the browser's bookmarks/ favorites toolbar. This plugin is the best convenient and fastest way to convert & download videos from Video anytime and anywhere. To use this method, please visit: https://ezdlvid.com/get-plugin. Vimeo app allows you to download the videos directly from the interface. On the display, there is a download icon, tap it, and your video will begin downloading to your device, and you’ll see a progress bar appear. Once the download has completed, you can find it under the Offline tab of your Playlists. However, the downloaded videos are only available for playback within the Vimeo app, and cannot be accessed by other apps. Don’t worry, you can find a download web app online that can efficiently save the videos straight on your device. It is really easy to use this web app, there are no technical skills nor in-depth knowledge involved. Step 1: Find the video you want to save on Vimeo app. Tap to play it. On the display, there is a share icon, tap on it, and choose Copy76 to Clipboard. 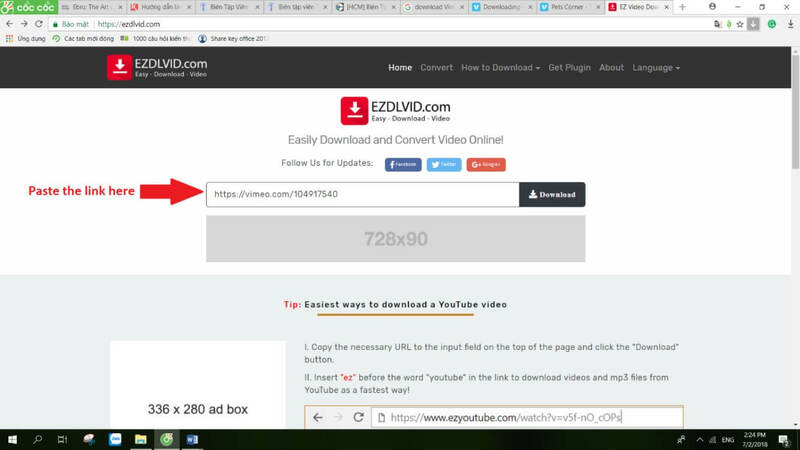 Step 2: Visit https://ezdlvid.com/ and paste the URL you copied into the text box. Tap Download. Step 1: Open Vimeo app and play your desired Vimeo video. While viewing the video, you will see a Share icon on the display. Tap on it and choose Copy to Clipboard. Step 2: Go to https://ezdlvid.com/ directly on the browser of your device, paste the URL into the text box, and tap Download. That is quite simple, isn’t it? If you haven't heard about https://ezdlvid.com/, you must have missed a simple and convenient online video downloader to download Vimeo videos and other videos. It helps your downloading and converting videos experience become simpler than expected. When it comes to watching online video, people alluded to YouTube. This is no surprise since YouTube is still the online video channel that many people choose, it owns a large amount of content on many topics with lots of videos. But if you have seen too much content on YouTube and need to find another video world, Vimeo is the first choice you should think of. Vimeo is a video sharing platform that was launched in 2004 by a group of filmmakers. Since then, Vimeo has grown to over 70 million creators, most of the artists in film, animation, music and other works of art. It differs largely from YouTube because of its “artsy” distinctiveness. It's just that YouTube is so huge that it encompasses everything you could point a camera at. Vimeo, on the other hand, is very much known specifically for creative artistry. While you can find thousands of junk videos elsewhere, the product on Vimeo is much more quality. From filmmakers, producers of music videos to cartoons selected Vimeo as the place to debut. The difference between Vimeo and other video posting services is that Vimeo is a community. Members often comment and suggest constructively, rather than denigrating, as users all move towards to a common goal. Of course, Vimeo is not for everyone. If you want to post or view videos about cats, song making, cover music... then YouTube is still a good place to start. But set foot on Vimeo, you will recognize a completely different world, the world for those who seek high-quality videos with great content and variety. From those fascinating things about Vimeo above, you may want to save your favorite videos to your computer/mobile so you can watch them without being connected to the Internet or on other devices. Below are the steps required for downloading and watching Vimeo videos on your computer for free.